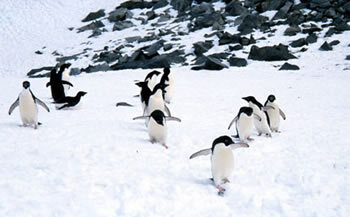 Adelie, Chinstrap, Gentoo, Macaroni, and Emperor penguins. Most penguins spend the majority of their life at sea and return to land to reproduce. 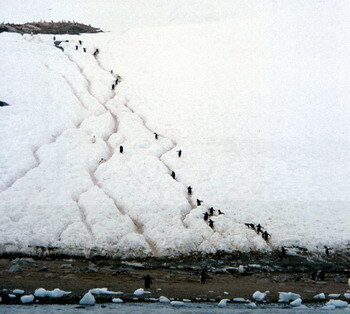 Getting to and from their reproductive areas (called rookeries) on land can be quite a walk but when there is snow to traverse, they often sled downhill to make quick descents. On land, penguins walk (often in straight lines) to and from the ocean between their nesting colonies and their feeding grounds in the ocean (left). These trips can be only a few hundred yards over rocky beaches (like the picture above left) or they can be miles inland, often over snow and ice. Penguins tend to follow the same paths to and from the ocean to feed and bathe. When there is snow in their path they leave footprints (right). Most penguin species spend the year at sea without staying with their mate, returning each summer to their original breeding grounds and often to their original mate. The numbers of Antarctic penguins has been increasing over the years, a result perhaps of the decrease (from whaling) in the number of baleen whales visiting Antarctica. Without so many baleen whales (krill eaters) visiting Antarctica the krill population has increased and there is more food than ever before for the antarctic penguins. The Adelies have an all black head. After only four weeks, the chicks molt their charcoal downy coat and grow the dense, waterproof feathers that allow them to leave the rookery and begin their lives feeding for themselves. Brood patch exposed on chinstrap parent. 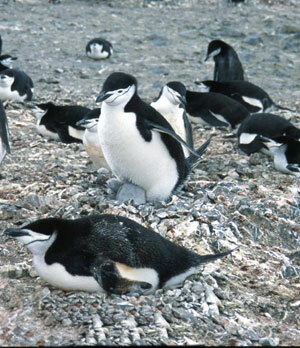 With a distinctive thin black stripe under their chin, the chinstrap penguin resembles the numerous Adelie penguins but is easily distinguished by their “chinstrap.” These penguins also feed on krill. 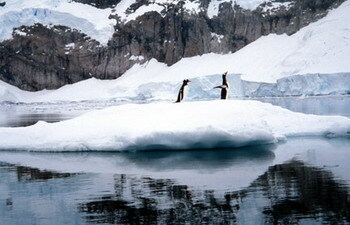 They are scientifically named Pygoscelis antarctica. Their chicks take about nine weeks before they are ready to go to sea. Chinstraps are more aggressive than the Adelies in their breeding behavior. This pebble nest serves to keep the eggs off the ground and allow melt water to run through. There is such a small window of time for breeding that the arriving penguins must build their nests immediately when they arrive, they can only use bare ground. If the snow melt is late then the areas for nest building are restricted. Chinstrap egg hatching - notice the crack. Baby chinstrap emerging from egg. The colorful orange bill (and white spot on the head) of the gentoo penguin, Pygoscelis papua, sets them apart from other penguin species. Their breeding habits are similar to Adelies and chinstraps – they return to the same rookeries each year, building nests of pebbles on bare ground, and laying two eggs. The chicks are ready to go to sea at eight weeks but they return each evening to be fed by their parents for an additional two weeks. 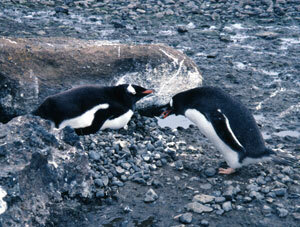 A gentoo male presenting his female with a precious rock for their nest. 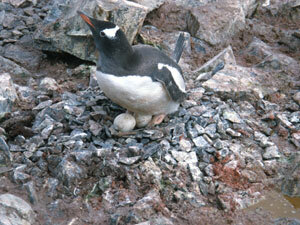 Gentoo parent incubating an egg. It is only in good years that the majority of mating brushtails are able to successfully raise two healthy chicks. During their short reproductive time, during the summer, there may be the occasional summer snow storm creating additional melt water and problems for the parents trying to keep their eggs and babies warm and dry. Gentoo parent with a newly hatched chick. 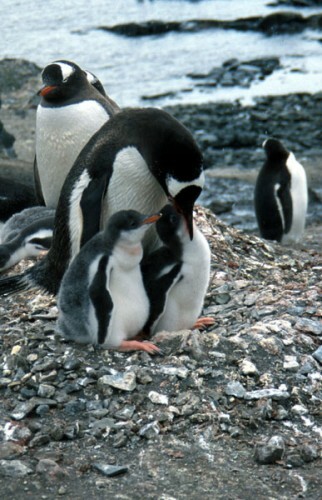 Gentoo parent with two nearly grown chicks. 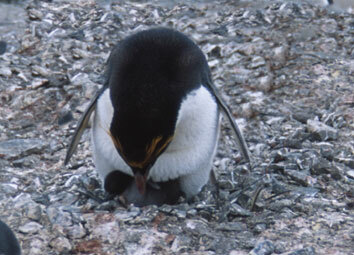 Gentoo parent feeding a chick. These healthy chicks are only weeks from being on their own. Note the bulging crop on the second chick! A snow field may separate the rookery from the ocean so the parents actually create “trails” in the snow as they walk to and from their nests, the parents taking turns caring for the babies and bringing food. 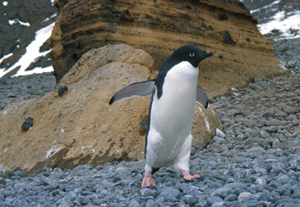 Gentoos have typical penguin feet, well adapted to walking over rough rocky terrain and snow. Their tough, fat feet have sharp nails for clinging to rock and digging into the snow. This species is different than other brushtail penguins in that the mated pairs usually stay together throughout the year. They are also a little bigger and shyer than other brushtails. 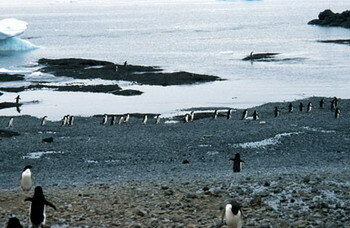 'Penguin trails' through the snow - from the ocean to the rookery. 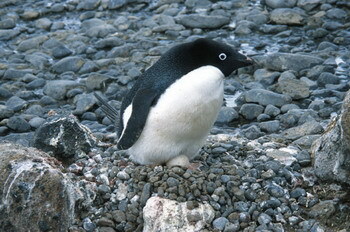 Penguin feet are callused and touch for walking through snow and on rocks. 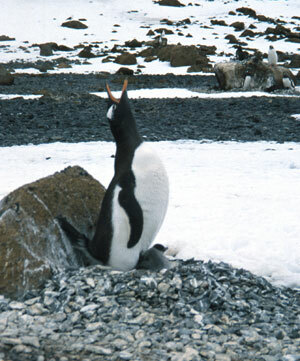 The nesting behavior of macaronis is uniquely different than the brushtail penguins. 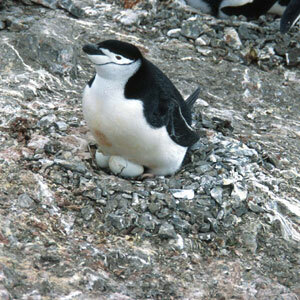 Although they have the same pebble nests, this species usually rears only one chick each season but lays two eggs. The first egg is smaller and darker than the second egg. It is pushed aside and usually does not develop although it is fertile. This purposeful waste of energy does not appear to have any adaptive value for this species. This macaroni chick came from the larger egg. There is no trace of the smaller, darker egg – probably having been eaten by marauding brown skua birds. The largest of the penguins on Earth, the emperor penguin, Aptenodytes forsteri,stands almost four feet high. Although these birds are very large, they have very unusual reproductive habits – they breed in the middle of the Antarctic winter, the most violent weather known on Earth. Other Antarctic penguins breed during the Antarctic summer, building pebble nests on the few rocky headlands available when the snow melts back. Most emperors breed on sea ice, often walking miles inland on the ice. There is no nest for the emperors, the female lays a single egg and it is immediately taken by the male, put on top of his feet, and he snuggles down over it and incubates it. 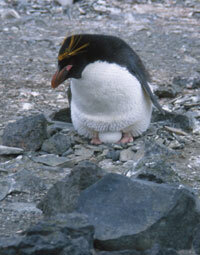 The females leave the males to do all the incubation during the two months of egg development. The males rock back on their heels (to keep the greatest surface area of their feet off the ice) and huddle together for protection during the fierce Antarctic winter storms. They can loose almost 1/5 of their body weight during this time but they wait patiently for the return of their mate. 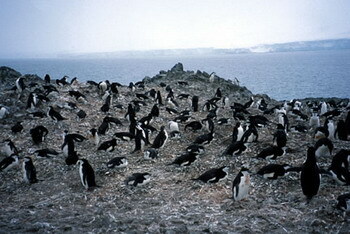 The females return right when the chicks hatch just in time to relieve the male and feed the newborn regurgitated krill. The weak males then return to the ocean, feed and come back to begin taking turns with their mate. The emperors go back and forth between the ice rookery and the ocean until their baby is ready to be on its own. In very cold years the distance to the ocean may be considerable and make it difficult for the emperors – which often results in poor reproductive years. In abnormally warm years the sea ice can break up and melt before the chicks are ready and this also results in reproductive catastrophes. All in all, the emperor penguin has picked the time and place of the worst weather on Earth to breed and has become successfully adapted. 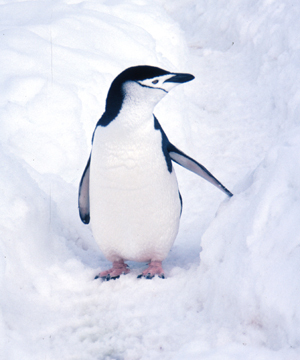 It is speculated that the time it takes to fledge such a large bird could not be accomplished during the Antarctic summer and so their winter reproduction puts their chicks ready to be on their own at the height of the Antarctic summer – during the big krill bloom and thus with abundant food. 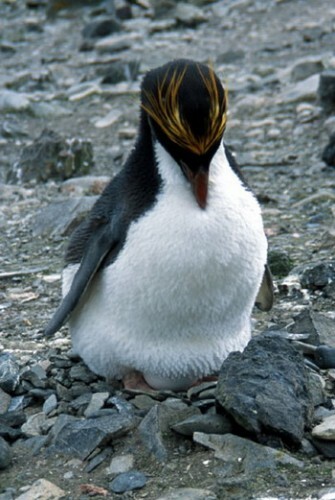 This may be the most important reason for the male emperors waiting out the two months of solid darkness, in the wild Antarctic storms just to incubate their single egg. Also, there are virtually no predators during the Antarctic winter to interfere with the reproductive process – oh, but what they put up with to achieve this is heroic. Not a single emperor penguin was sited during the author’s trip because the trip was during the Antarctic summer so there are no images of emperors in this presentation.